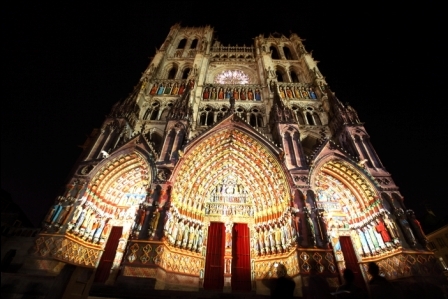 Notre-Dame Cathedral in Amiens presents “Amiens, la Cathédral en Couleurs”, a colorful show! The program includes the renewed enchantment of polychromy, with the music of words, the melody of the French language and the acoustic universe of an orchestral repertoire with lyrical accents that are both ancient and more contemporary. Listed as a UNESCO World Heritage Site, the cathedral has imposed itself as the reference in Gothic portal polychromy since its restoration. This restoration inspired the free show that proposes a restitution of medieval colors through the projection of high-definition digital images. The show takes place from June 15 to the third Sunday in September and during year-end festivities from December 1 to January 1.